Congratulations to Anders Koppel who today turns 71! Yesterday I had the privilige of premiering his 2nd Accordion Concerto at @Frederiksværk Musikfestival for a terrific audience with The Danish Youth Ensemble and conductor Morten Ryelund. 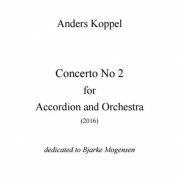 The Concerto was generously supported by Oticon Fonden, Augustinus fonden & Statens Kunstfond. A huge thanks for the fundraising work to Lone Ricks. And a big thank you to Frederiksværk Musikfestival for hosting the performance of this great new piece.